Richard Branson said he has concerns over Donald Trump's leadership. Picture: Paul Kane/Getty Images. WHEN it comes to money, Sir Richard Branson has it all. Well, maybe not all - but a whole heap of it anyway. 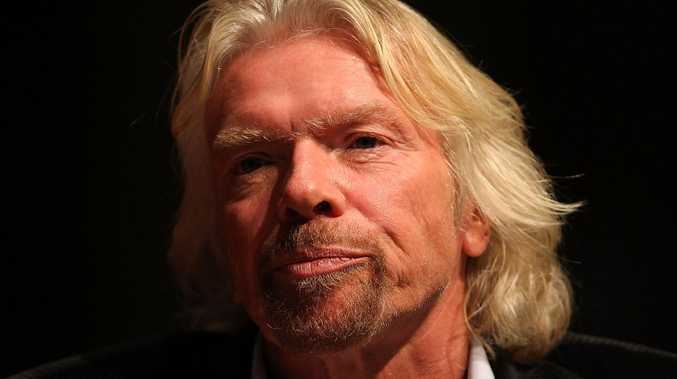 According to Business Insider, the 69-year-old's Virgin Group is worth a whopping US$5 billion, and while most of us would splash that out on lush holidays and fancy champagne (guilty), Branson says he wishes people would let him spend more of it. In an interview with news.com.au, Branson said his credit card was often turned away when it came to dining out at his favourite restaurants around the world. "Obviously if you're in that lucky position where you can afford (to pick up the bill) you should do it," he told news.com.au, fresh out of a 20-minute spin workout. "But one of the bizarre things about being successful and making money is the amount of times restaurants will say, 'oh, don't worry Richard, we don't expect you to pay'. "Surely there's someone else who would warrant that more than me. Picking up the tab is a luxury I can afford to do." Having spent the past week in Australia, Branson paid a visit to one of his recently opened Virgin Active gyms in the Barangaroo precinct. His appearance coincided with the fitness centre's announcement of a new global fitness focus that will be launched across the world over the next 12 months. The gym's new direction is aimed at providing consumers with exercise experiences anytime, anywhere, and is not restricted to customers going to an actual gym. Australia will be leading the charge with the global initiative, with the upcoming four concept clubs to take on the new proposition in Australia throughout 2019. 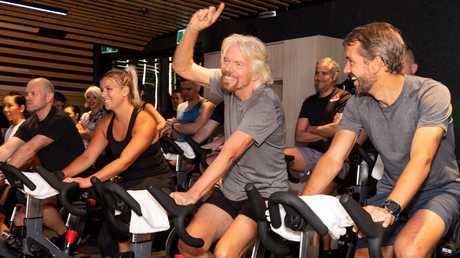 Sir Richard Branson at Sydney's Barangaroo Virgin Active. Branson, who has only recently started going to one of his gyms for weight training, said exercise has always been part of his lifestyle - especially as he heads towards his 70th birthday. "I always play a very hard game of tennis first thing in the morning before breakfast and then I do that again in the evening," he said. "I play someone who is better than me, a professional, and that's something I try to do every single day. "I live on an island, and if the wind is up, I will go kite surfing too. "If I can do those two things, it sets me up for the business day ahead. 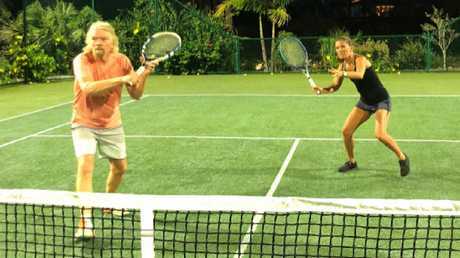 Some turn to coffee first thing, but Sir Richard Branson says a hit on the court is what fires his engines for the day ahead. "But approaching 70, I have to do some weight training … so I now do that as well to try and build the body up. "We have three or four hundred gyms across the world and I am only just starting to go to one now." It's been nearly 55 years since Branson dropped out of high school at the age of 15 and founded his first business. 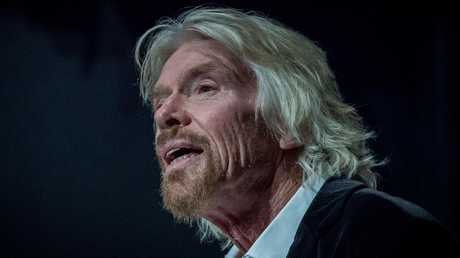 Overseeing around 500 companies globally throughout his lifetime, the savvy businessman says one of the best parts of being Sir Richard is the pull he has on some of the biggest celebrity and political figures in the world. "The best thing about becoming a success and being recognisable is being able to write to anybody and get through to anybody (and) that you can get anything done," he said. "Most of my time is now spent on not-for-profit ventures trying to sort out some of the bigger problems in this world. "It has helped enormously to be able to write to a prime minister or a president and lobby them on specific issues and try to get laws changed and make the world a little bit better. It's nice to be able to play ones part in that." Speaking to the ABC's 7.30 earlier this week, Branson likened climate change to World War III and said the Australian government needed to step up to stop rising greenhouse gas emissions. "It's going to need the world to take this problem very, very seriously," he said. "Let's pretend this is World War III. "My feeling is that we need to convene governments and the business sector … on a global basis." Speaking with news.com.au, Branson also got stuck into US President Donald Trump and his Republican party, which includes many members who are self-described climate change sceptics, questioning whether the overwhelming consensus of scientists around the world about man-made causes for ever-rising temperatures is accurate. The Trump administration has dismantled emissions reduction policies domestically, and vowed to ditch the Paris treaty on attempting to reduce greenhouse gas emissions worldwide. This week, Mr Trump told reporters he was yet to read a UN report warning of global warming-caused chaos around the world, adding that he was sceptical. Addressing Mr Trump's leadership and his administration, Branson said he was "uncomfortable" with his policies. 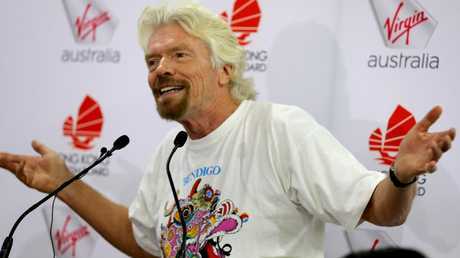 "There are a lot of big problems in the world which needs us all to unite together as one world," Branson said. "He and about two other people are trying to do the absolute reverse. Putting up barriers and trade barriers is likely to cause a recession and I disagree on (his policy) on gay rights, capital punishment and drug reform … but there's a whole lot of things the Republicans stand for (including views on climate change) which I personally disagree with." On Thursday, Branson launched a new initiative by Virgin Australia that will soon let anxious flyers get extra support to cope with their nerves. The collaboration with Smiling Mind is the world's first meditation flight, and will allow nervous passengers extra support to cope with their flight.